Matt Miller (@jmattmiller) mentioned to me in a tweet last week that I was in his most recent blog post. 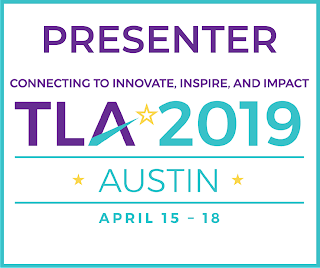 Sherry Gick (@LibraryFanatic) – She’s got to be the coolest school librarian (err, media specialist … what are you exactly, Sherry???) there is. She’s constantly redefining a space in schools that can stagnate without attention or thrive in a new model. She’s a runner and she has a super abundance of energy. Wow! Reading that brought a HUGE smile to my face and reminded me that even on days when it feels like you're beating your head against the wall at school, you can still be making a difference. Also a great reminder that you never know who's paying attention to what you post online! Sharing is definitely caring and our Twitter PLN is the very best. Thanks Matt! You know I'm a huge fan of yours! So what is the #TwitteratiChallenge? I had to check it out for myself! 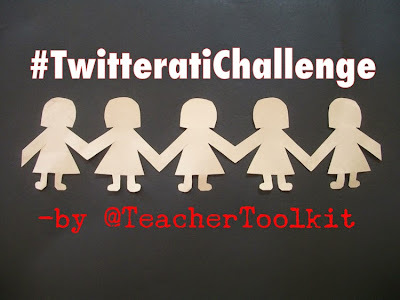 After searching the hashtag on the Twitters, I also visited @TeacherToolKit's blogpost here. "In the spirit of social-media-educator friendships, this summer it is time to recognise your most supportive colleagues in a simple blogpost shout-out. Whatever your reason, these 5 educators should be your 5 go-to people in times of challenge and critique, or for verification and support." 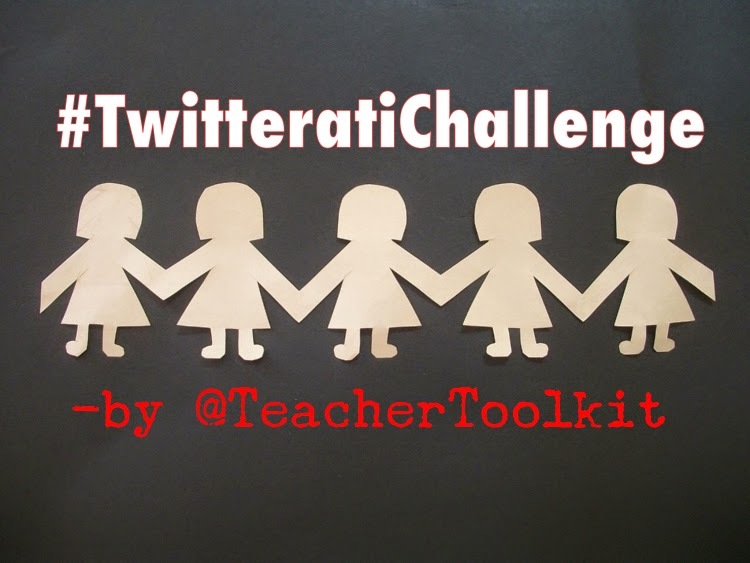 The educator who is now (newly) nominated, has seven days to compose their own #TwitteratiChallenge blogpost and identify who their top five go-to educators are. I met every single one of these lovely individuals on the Twitters FIRST. I've since met all 5 of these people in person! I consider each of them absolute dear friends as well as my go-to-educators. I can ask any of them for help any time and they would all be willing to lend a hand. I could write PAGES about every single one of these people -- how they've inspired me, buoyed me, supported me, made me laugh, and about their overall amazingness but basically I'm just thankful to call them friends. Matthew C. Winner - (@MatthewWinner) If you know me, or follow me on Twitter, you know Matthew is my all-time go-to-educator. We've talked about being #edusoulmates on his podcast and to anyone who will listen. Matthew has made me a better Teacher-Librarian. This year we haven't had the opportunity to collaborate very much, but we continue to support each other and always have an ear and idea or two to lend to the other. Jonathan Werner - (@MaineSchoolTech) - Jonathan never ceases to amaze me with his technology knowledge and his endless energy! We've started calling each other Batgirl and Robin for reasons yet to be revealed... He's the only LITS (Library & Instructional Technology Specialist) I know and I hope that I am even half as great at my job as he is! Kathy Burnette - (@theBrainLair) - Kathy also lives in Indiana but we're not close together geographically. I greatly value her opinions and knowledge as a fellow teacher-librarian. I also know that if I want the truth and no punches pulled, she's the one to give it to me. She never fails to make me smile with her deadpan wit and sarcasm. I hope to be just like her if I ever grow up. Tiffany Whitehead - (@Librarian_Tiff) - Tiffany rocks the library world. Period. She is known and well-respected across the world in the TL community. Her moniker, "The Mighty Little Librarian" is accurate! She is a force to be reckoned with and knows her stuff! Constantly sharing with her students, staff, and the TL community, Tiff is the TL everyone wants to be! So there you have it... my Twitterati list! If you're not following all of them on Twitter, please fix immediately! I have such an amazing PLN of educators on Twitter. There are so MANY names I didn't mention but this is my top 5. Everyone needs go-to people like them. I hope you have the opportunity to meet any or all of them in person... each of them have truly been life changing peeps (tweeps?) for me! I'm acquainted with all of these people and you're right! It's always encouraging to be praised. I think I may follow them all on Twitter, but to get the full benefit, I'd have to actually read my whole Twitter feed. Sigh. I'm afraid that I am still very much a librarian!